5.) What is the scope of the destruction beyond Damascus? Some scholars, like Dr. Mark Hitchcock, believe this prophecy already found fulfillment around 732 BC, shortly after it was presaged in Isaiah 17, when the Assyrians conquered Aram. Aram was the ancient name for much of modern day Syria. But if it was fulfilled then, why did Jeremiah 49:23-27 predict a similar scenario about a century later? And, why did Isaiah mention Assyria 37 times throughout his 66 chapters, but never once mention it in Isaiah 17. For instance Isaiah 8:3-7 clearly identifies an Assyrian conquest of Damascus. This found fulfillment in Isaiah’s lifetime, but Damascus still exists today. Also included in the Psalm 83 book is a second chapter that provides additional details about the destruction of Damascus, and it is called “The Destruction of Damascus Continued.” Because of the burgeoning concerns that Syria and Israel might soon become engaged in a major military confrontation, I am posting this secondary chapter about the doom of Damascus below. This article answers some of the prophetic questions being asked about the future fate of Damascus. Three passages in Isaiah 17 deposit important details about who destroys Damascus and how quickly the city is toppled. Isaiah 17:1, 9, and 14, teach that Damascus will someday be reduced to a heap of rubble (verse 1) overnight, between some sunset and sunrise, because Damascus attempts to “plunder” and “rob” “the children of Israel,” (verse 14) who in return retaliate (verse 9). The Hebrew word used for both plunder and rob is bazaz. This dual usage infers that Syria, represented by its capital city Damascus, will be guilty of plundering and pillaging Israel. The bottom line, according to Isaiah 17, is that Syria will experience widespread desolation, seemingly because they preemptively attempt to create desolation inside Israel. 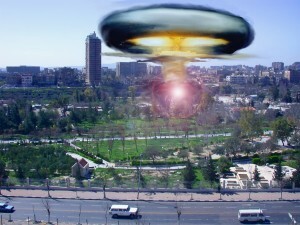 Damascus will be destroyed, leaving Syria with no capital city. 8. The lord will kindle a fire and consume the palaces of Ben Hadad. By connecting Jeremiah’s passage to Isaiah’s we get a grander picture surrounding the destruction of Damascus. Although some expositors teach that Jeremiah 49:23-27 found fulfillment during Jeremiah’s time through the Babylonian conquest over Damascus, clues in Jeremiah’s passage suggests otherwise. For instance, Jeremiah asks Damascus, “Why is the city of praise not deserted, the city of My joy?” This alludes to Jerusalem, which was destroyed and deserted during Jeremiah’s lifetime. Therefore, Jeremiah’s rhetorical question to Damascus about Jerusalem would prove pointless at the time. Conversely, Jeremiah’s passage makes complete sense when aligned with Isaiah 17. For instance, Hamath and Arpad, two northern Syrian locations, are shamed because they receive troubling news. They become distressed along with Damascus, because they are all about to become battle zones. These ancient cites, mentioned dozens of times in the Bible, historically ranked among the more important cities of Aram (modern-day Syria). Hamath is approximately 120 miles north of Damascus, and Arpad over 200 miles northeast of Damascus, about twenty-five miles north of today’s Aleppo. Therefore, when Isaiah 17:9 predicts Syria’s “strong cities will be as a forsaken bough And an uppermost branch,” we presume from Jeremiah’s descriptions the IDF’s retaliation against Syria will cause the abandonment of several formidable “strong” Syrian cities in addition to Damascus. The population of Syria in 2003 was estimated by the United Nations at 17,800,000, which placed it as number 55 in population among the 193 nations of the world. In that year approximately 3% of the population was over 65 years of age, with another 41% of the population under 15 years of age. There were 102 males for every 100 females in the country in 2003. According to the UN, the annual population growth rate for 2000–2005 is 2.38%, with the projected population for the year 2015 at 23,018,000. The population density in 2002 was 95 per sq km (245 per sq mi), but most of it was concentrated in a small area; 70% of Syria’s people live in Damascus and the six western provinces. Damascus is the capital of one of Israel’s main enemies and is a strategic target for Israel in the event of a multi-front war with Iran, Hezbollah, Hamas, and Syria. Syria is among the Arab countries that refuses to recognize Israel’s right to exist. They fought against Israel in 1948, 1967, and 1973. Unlike Jordan and Egypt, Syria has refused to make peace with Israel because it wants the Golan Heights returned, which Israel captured in 1967. Technically Syria is still at war with Israel and tensions between the two countries remain high. On September 6, 2007, Israel attacked a suspected nuclear reactor in the Deir ez-Zor region of Syria as part of Operation Orchard. Threats and rumors of war have characterized the standoff between the two countries. In an interview with BBC TV on June 17, 2010, Syrian president Assad accused the reigning Israeli administration of Benjamin Netanyahu of being a “pyromaniac government,” and stated that there was no way to achieve peace with such a government. (iii) His comments came on the heels of the Mavi Marmara incident where nine Turkish activists died on a flotilla bound for Gaza. Even more recently these headlines have appeared concerning the rumors of war emanating between Israel and Syria. Syria’s arsenal includes the most advanced scud missiles in the world. (v) Additionally, Damascus is one of the closest major cities to Israel’s borders and could be used as a staging area for a ground and air attack into Israel given its ideal location between Iran to the east and Lebanon to the northwest. Logically, if Israel comes under a multi-front attack from enemies possessing weapons of mass destruction, it will have to act aggressively, expeditiously, and decisively. Israel is the approximate size of the state of New Jersey, meaning a couple nuclear bombs could wipe the Jewish state off of the map. Israel doesn’t have the luxury of waging a war of attrition. It’s a matter of survival for the Jewish state and the destruction of Damascus by the IDF would indicate to its enemies that the war has become an all-or-nothing proposition. (ii)http://www.nationsencyclopedia.com/Asia-and-Oceania/Syria-POPULATION.html Information accessed over the Internet on 12/14/2010.